To make cornbread, heat oven to 450 degrees F. In a large skillet over high heat, cook bacon until crisp. Drain bacon on paper towels, chop, and set aside. Reserve bacon grease. Grease an 8-inch square glass baking pan with bacon grease. Set aside. In a large bowl, combine bacon, cornmeal, sugar, baking powder, baking soda, and salt, and mix well. In a separate bowl, whisk together milk, cream, and eggs. Add the milk mixture to the cornmeal mixture and whisk just until blended. Place the empty pan into the oven and heat until the bacon grease just begins to smoke. Pour in the batter and bake until the top is brown and a toothpick inserted in the center comes out clean, 20 to 25 minutes. Cool completely on a wire rack. For the stuffing, in a large nonstick skillet over high heat, cook sausage until slightly brown, breaking it up with a spoon, about 3 minutes. Add onions, celery, and peppers, reduce heat to medium and continue to cook, stirring occasionally, 10 minutes more. Cut the corn bread into cubes and transfer to a large bowl. Stir in sausage mixture until well combined. Add parsley, sage, thyme, salt, and pepper and mix well. In a cup, whisk orange juice and eggs until well blended, then stir into stuffing. 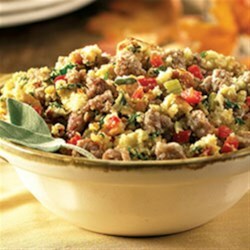 The stuffing can be baked off in a pan or stuffed into your turkey or pork loin.